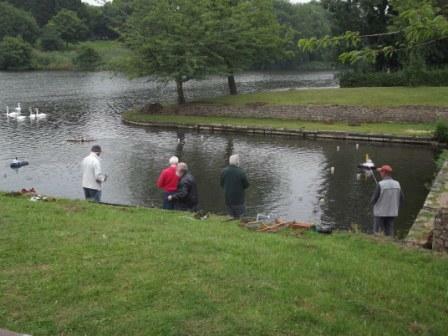 Report: Open Day at Coate 25th August. The day went well in spite of the overcast morning. George laid out an apparently simple layout of buoys for us to play with during the morning session. 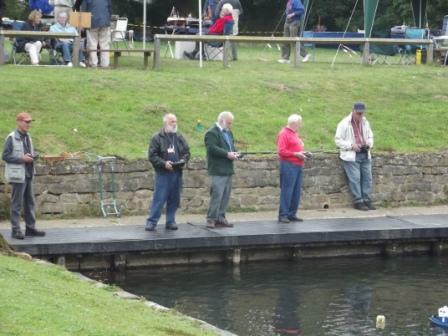 We were pleased to be joined by five visitors from the Mid-Thames Model Boat Club with an impressive array of boats. They all seemed to have a good time especially the the sailboaters who seemed to like the wide open spaces of the main lake. After a short lunch break a competition round the buoys broke out. In the case of Brian Freegard's 'Guardsman' it was the motor mount and coupling that broke out. The first prize went to John Brown with his 'Glasgow' tug. Thanks to all who helped on the day, especially the ladies who supplied the cakes and savouries. The table cloths were a civilising influence at a normally male event. Thanks also to the hard work done by the weed clearing gangs during the preceding weeks which proved to be very successful. And thanks to our visitor from Beale Park who entered so well into the spirit of the occasion. Let us hope that this can become an annual event.